A book burning has caused severe damage in east Florida. A book burning in Nassau County, Florida sparked a wildfire that destroyed two homes, CNN reported. Annaleasa Winter, of the Florida Forest Service, said during a news briefing this past Wednesday that the fire — the caliber of which the county hasn’t seen in quite some time — began because a man was trying to illegally burn paperback books. Called the Garfield Road Fire, this wildfire is the most devastating fire in the country since 1998, when wildfires caused $600 million in damages. Justin Sullivan/Getty ImagesA house burns after being overcome by flames from the Rocky Fire on July 31, 2015 in Lower Lake, California. Over 900 firefighters are battling the Rocky Fire that erupted to over 15,000 acres since it started on Wednesday afternoon. The fire is currently five percent contained and has destroyed 3 homes. According to Billy Estep, director of emergency management in Nassau County, the man had been trying to burn a large pile of trash and did not intend to commit an act of arson. “[It was] purely an accident,” he told CNN. Florida law prohibits its citizens from burning household garbage — and for a good reason. Windy conditions caused this particular wildfire to grow at least five acres in size, burning roughly 696 acres in total. 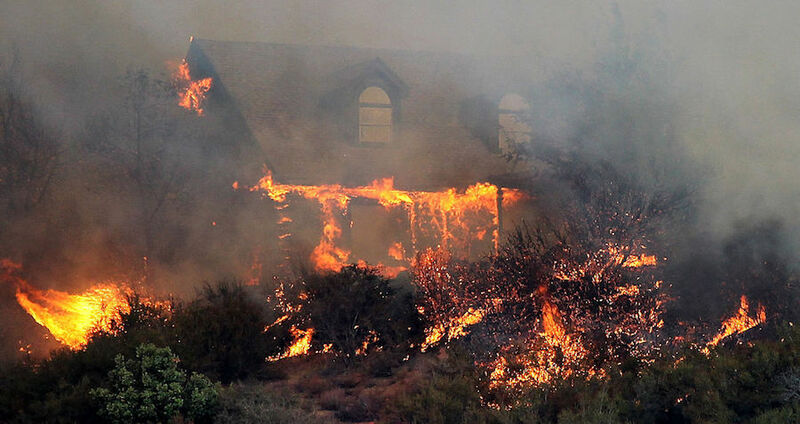 Firefighters contained around 80 percent of the fire by Thursday, officials said. While the Florida Forest Service declined to name the man who started the fire, they will send him a pretty hefty bill — which includes the cost of the equipment used in the fire and paying the personnel who fought it — in addition to a notice of violation. The man will also be held civilly liable for the damage the fire caused. Considering that six other homes were severely damaged, plus 19 sheds and outdoor structures, this could amount to hundreds of thousands of dollars. Next, check out how a Florida man attempted to burn down a convenience store to “run the Arabs out of our country,” before finding out about the vigilante who killed a teenage shoplifter for stealing diapers at a Florida Walmart.